All my life I’ve struggled with completely finishing things, so bingo might be a better hobby than quilting, I sometimes feel. Anyhoo, this has been bound, labeled, and provided with its coordinating tote bag. And after going back and forth on it for a few times, I put handles on the tote bag. This photo shows the bag. Almost every piece of fabric has a story, either where it came from or how it was made. See the blue and red swirly fabric towards the bottom of the bag? That was a serendipitous piece created when I was using a hatband that had turned out too tight as a wiping rag when I was dyeing fabric. For years this was a piece that was waaaay to beautiful to cut. see here for a close up photo. The pink and green paisley to the right of it comes from either Susan Purney Mark or Daphne Greig. Many small squares of it have been floating around Victoria, and I’ve collected pieces from both of them. The fun thing about making this is that it grows itself and is a fast stash buster. I’ve tried designs that purport to bust stash but require a lot of time and patience to work with smaller pieces that can’t be strip pieced. After the twin bed topper was done I had no less scraps than before I started. If my scraps continue to grow it’s because I keep an eye open for small pieces that other people have given up on! No, no set in seams here, thank you very much! 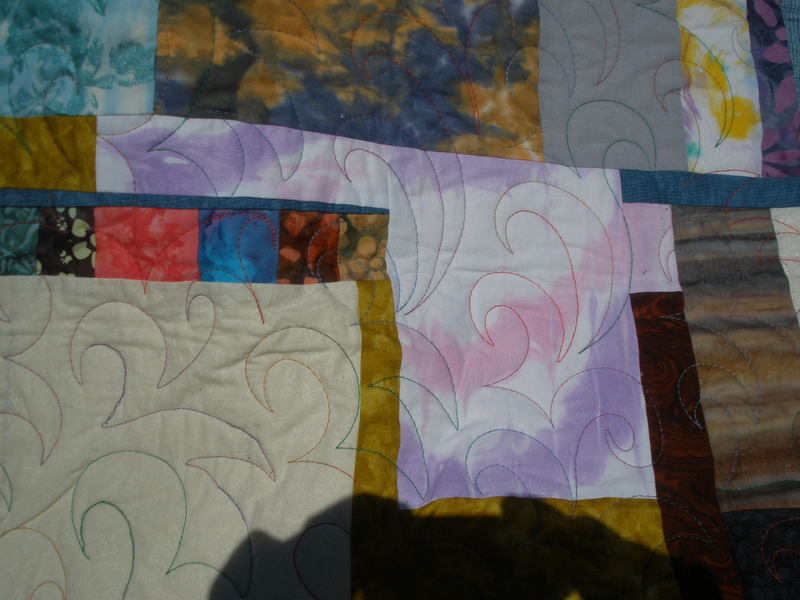 I’m working with strips and with pieces that are smaller than a fat quarter. 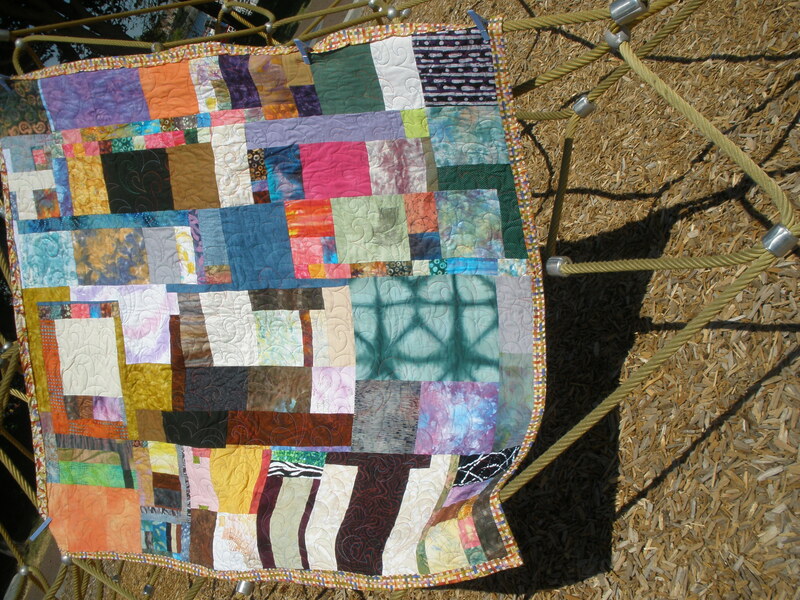 If you click on this photo Andrea Hamilton’s mid-arm quilting shows to much better advantage on the light fabric. We chose Valdani Gem Symphony. Nothing representational really, although I do have one butterfly on my cushion. 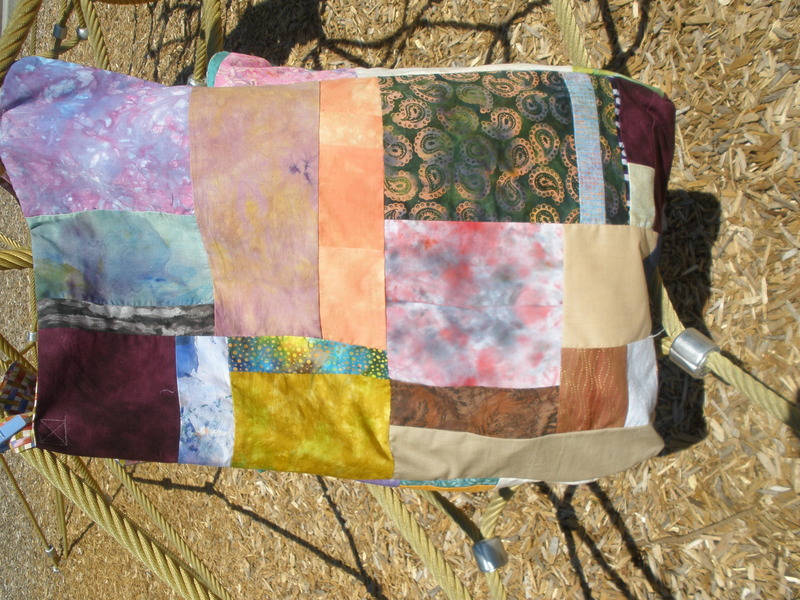 The fabrics are mostly solids, tone on tone, neutrals, batiks and surface design pieces. However in the spirit of nothing representational, I’m not using batiks with really in your face pictures on them, like flip-flops. I’m not allowed to get too precious and agonize over whether adjacent fabrics look good together. Some do, some don’t. Some of the fabric is too beautiful to cut and some was what I couldn’t sell at the Guild garage sale! And some came from fellow surface design folks who were cleaning out their studios and desperate to see the back of their own stash. Since the fabric is used to make larger items there is not a set block size. 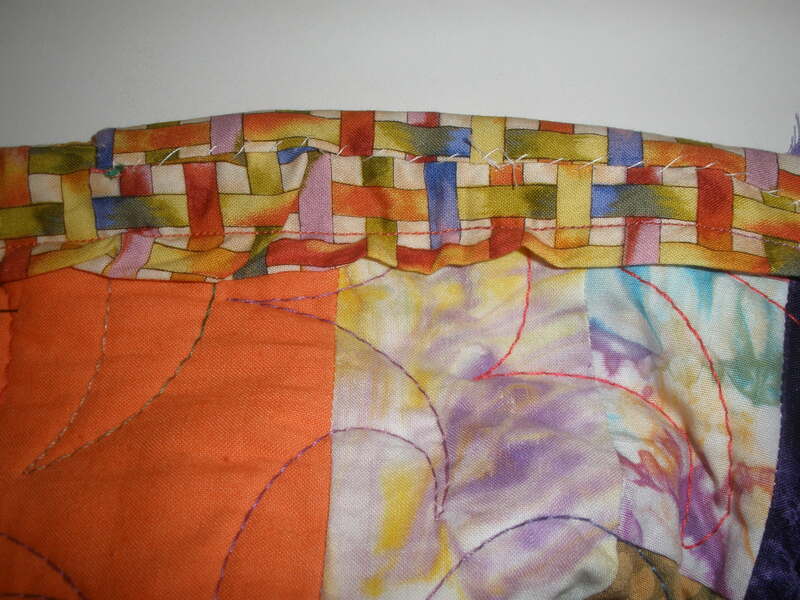 I sew pieces to each other and build long strips about 7 to 10 inches wide and as long as the width of a twin bed quilt. Then when I’m going to make something I play around with these strips and figure out the final design. And although some oriental carpet makers and Amish quilters put deliberate errors into their pieces because perfection belongs to God alone, I doubt I’ll ever come close to needing to do that! There’s a non deliberate error in the tote (one handle is twisted, aaaarrrgggghhhh! and another (really galling) one in the quilt itself. « Disappearing 9-Patch, work in progress!